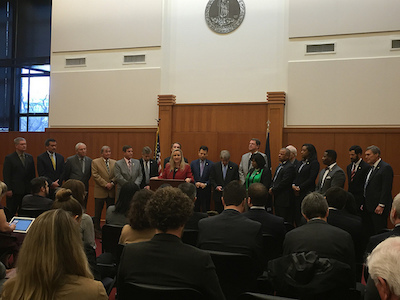 Sen. Amanda Chase speaks at press conference announcing the deal on January 24. Surovell’s Senate Bill 1533 specifically targets the ponds in Prince William, Chesterfield, and Fluvanna counties, and the city of Chesapeake. Dominion Energy, which operated the coal-fired power plants, would pass along the cost of the cleanup to customers. The company would be required to use local labor and resources when practical to remove the material.